- Publisher Hands-Down the Finest Audio New Testament You Can Own. The KJV Audio Bible is more than a Bible you listen to. It's an experience that helps you enter into God's Word ... So God's Word can enter into you. Read by professional readers. 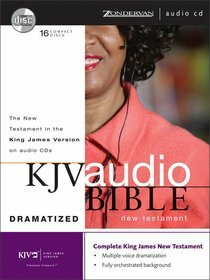 About "KJV Audio New Testament Dramatized (Unabridged 18 Hrs)"
Hands-Down the Finest Audio New Testament You Can Own. The KJV Audio Bible is more than a Bible you listen to. It's an experience that helps you enter into God's Word ... So God's Word can enter into you. Read by professional readers.